First workout of the week was back to normal with a pace run, starting to dip in duration though and it had long strides at the end of it as a consideration for the track. I started a little late which meant that I had to deal with some of the heat, but running on the greenway by the stream with plenty of shade mitigated most of it. The pre-race workout was a standard two miles brisk and then K’s. Felt decent enough running low 2:40’s which is a big change from last Saturday. I arrived out in Portland on Friday afternoon and will be staying with a fellow runner, Ryan Vail, for the duration of my stay in Portland. The Portland Track Festival was a great meet, low key, very well run, pacers for all the top heats and perfect weather. In short, you couldn’t ask for more to run fast. The race started out quickly for me, 4:20 first mile. There was some pushing and shoving in the first two laps and someone did by the dust hard right at 600 or at 1000 (it was as we passed the finish line). My legs were fine with this pace, however when the lead pack (which I was at the back of) dropped a 63 around 2400, I fell off into no-man’s land which is an unforgiving place to be. I slowly started leaking time and went through 3200 in 8:44 for a 4:24 second mile. My legs were starting were feeling the track burn which is quite a different sensation than you feel on the roads or when working out in the heat where the pain is of core body temps rising. I could have dealt with it better, this was a subpar mental effort day, and ended up sliding all the way back to a 4:36 last mile and a 13:56 overall disaster. Obviously this was not the outcome that I was looking for, however, I’m just starting track season and the only race that I really care about is the 10k on July first. 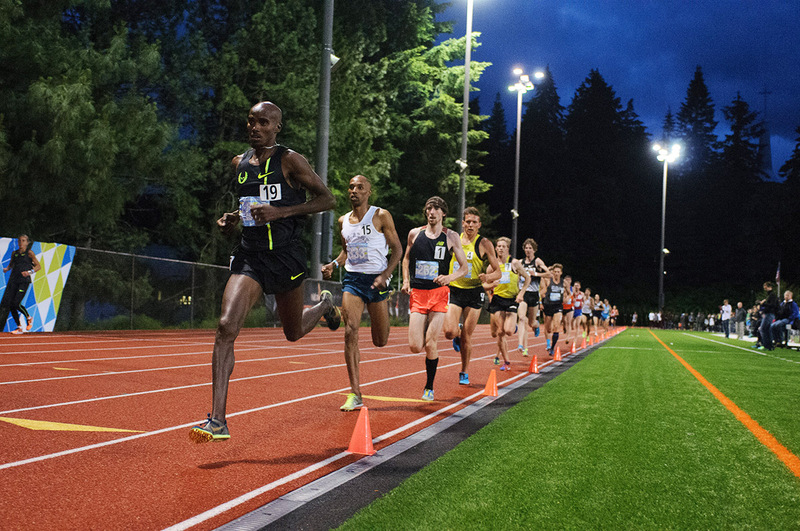 The next tune-up in twelve days will be another chance to become accustomed to track pain. *I flipped Friday’s run with Monday’s long run for mileage counting purposes to keep a long run in the week. As long as the mileage is hit over the two week span, that’s just fine with my coach and me.